Rewards your Students with FREE Laser Tag Games at Laser City! 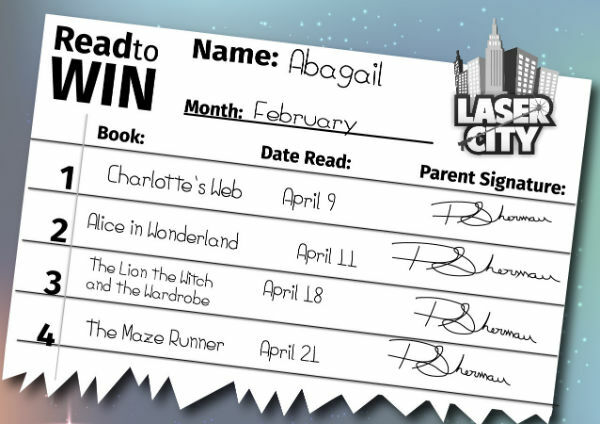 The Laser City Read To Win program is a free program for teachers in the Edmonton and Calgary area, designed to encourage students in Grade 1-6 to read more by rewarding them with free games of laser tag at Laser City! For every book or chapter the student reads, they complete a line on their Reading Sheet. After the complete a Reading Sheet, they put it into the Entry Box in their classroom. At the end of the month, the teacher randomly chooses a Reading Sheet and awards that student a Certificate that is good for 2 free games of laser tag. The contest then restarts for the next month. The program is completely free to teachers and schools - we supply everything required to run the program including the Reading Sheets, Entry Boxes, Laser Tag Certificates as well as letters to parents to explain the program. We'll even deliver them for free! To join the program, click the link below and complete the form. If you're a returning teacher, you can also choose to only receive the paperwork/certificates and keep using your existing entry box. We're also able to come and visit your school and do a short presentation to your students in an assembly, also at no cost! Just select the option in the sign-up form, or email us!